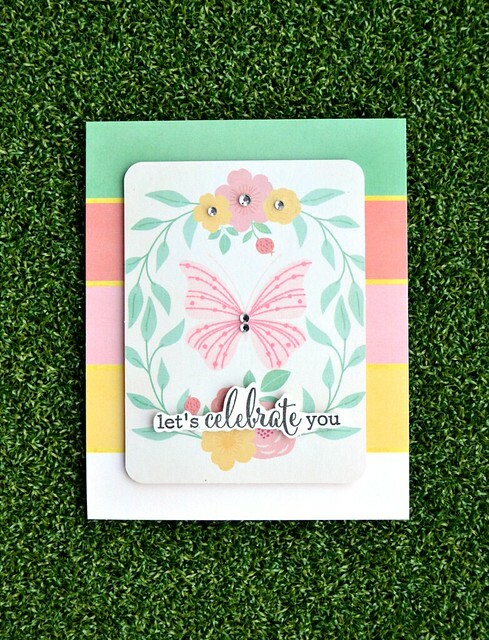 I'm still on a bid to use and enjoy some of the pretty stash I have just sat here waiting for me so I've used up a teeny bit more of my BoBunny You're Invited collection with this stamp set. I just felt that the butterfly suited and fitted the journalling card design perfectly. I originally stamped the sentiment directly onto the printed design, but I felt it was lost in the pattern so I stamped it again onto cream cardstock and carried out some serious fussy-cutting to affix it on top. Project rescued! Thanks so much for visiting this little corner of Blogland today!